Trainer Ben Pauling scored his first Festival victory when Willoughby Court took the Grade One Neptune Investment Management Novices' Hurdle in a thrilling battle to the line with Neon Wolf. The David Bass-ridden Willoughby Court, a 14/1 shot, made the vast majority of the running but in end only scored from 2/1 favourite Neon Wolf by a head in a photo-finish. Pauling, who trains in Gloucestershire near Bourton-on-the-Water, said: "I can't believe it, honestly. It feels as good as I ever hoped it would and better. To do it for Paul [Rooney, owner], who has been a great supporter of mine since my second season when I literally had 12 horses, means a huge amount. "Jason [Maguire - the owner's racing manager] has been a big part of the whole thing and my wife Sophie supports me day in, day out. It is fantastic, even down to Greg Walters who rides Willoughby Court every day because he is not an easy horse. I suppose Bassy did an all right job as well!" "We set out with a plan. There weren't any confirmed front runners apart from ourselves, and I said to David [Bass], 'get him into a rhythm and then let him do what he can from there on in. He settled beautifully, didn't miss a beat on any of the hurdles, and I saw Neon Wolf coming there between the last two and I admit I was slightly concerned, but I hoped we'd get him off the bridle and we did. He was gutsy as you like and I think that was an absolutely exceptional ride from David. "I think David and Nico [de Boinville], the two boys I use, their clocks from the front are second to none - they can almost ride others to sleep and I think that's exactly what happened today. "Willoughby Court was an impossible horse to train for two years because he was so fractious and nervous, and this time he has just been a different kettle of fish. "Greg Walters, who rides him every day, has done an exceptional job and he is here today to enjoy it. "This means everything and more. We've had a fantastic start to my training career, and the yard, my support and my staff are exceptional, but this is really is the icing on the cake. "Every option is open now, but I don't think we will be seeing Willoughby Court at Aintree. Never say never, but this could be the end of his season." Willoughby Court became trainer Ben Pauling's first Festival winner under jockey David Bass. The 14/1 winner held off 2/1 favourite Neon Wolf by a head, with Messire Des Obeaux (8/1) a further three and three-quarters of a length back in third. Bass was riding his second winner at The Festival, following Darna's 2015 success in the Brown Advisory & Merriebelle Stable Plate for trainer Kim Bailey. Today's win was particularly sweet for Bass, who rode Charbel in yesterday's Racing Post Arkle Challenge Trophy, and was still in contention when falling two out. 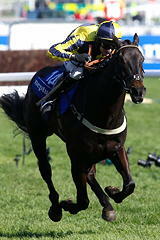 Bass said: "Yesterday was a massive disappointment for me and Kim [Bailey, Charbel's trainer], but today was brilliant. It all went to plan, he was tough on the run-in, he stays very well and it worked out. "He has form over two miles five furlongs on heavy ground, and my worry was that I hadn't ridden him on decent ground. I feared his stamina might not come into play, so I rode him positively and he really got into a lovely rhythm. We respected Neon Wolf, and when Noel [Fehily, on Neon Wolf] got to me turning in I thought it would be a close-run thing. "He [Willoughby Court] is a three-mile chaser in the making and I think he's got a big future over fences. "I went home last night and watched the replay [of Charbel] quite a few times and it hurt - we'll never know what will happen. I woke up today and said 'right, you've got two good rides today, so focus on that'. Ben is a really good young trainer, very ambitious and with good staff. It will mean a lot to him." Trainer Harry Fry was pleased with the run of 2/1 favourite Neon Wolf who finished an agonising head second to 14/1 winner Willoughby Court, trained by Ben Pauling after a prolonged battle. Always handy under Noel Fehily, Neon Wolf cruised into contention approaching the home turn and looked the likely winner in the home straight. However, Willoughby Court under a never-say-die ride from David Bass, found plenty for pressure and gamely repelled the sustained challenge of Fry's charge, to score by a head. Alan King's Messire Des Obeaux (8/1) was a further three and three-quarter lengths behind in third. Fry said: "All credit to the winner, he just pulled out more and more. I'm absolutely delighted with the run of Neon Wolf. We have a lovely horse on our hands. Obviously, we would've loved to have won but all credit to Ben Pauling and his team for a fantastic performance by the winner." The six-year-old son of Vinnie Roe pecked on landing at the final flight but Fry refused to blame that for the defeat, commenting: "There are plenty of what-ifs in racing. We were second on the day and we will now look forward to having an exciting horse on our hands. "He has got the trip no problem. He was keeping on again at the end but the winner just kept finding a bit more. There we go, that's racing and they don't win all the time. He's run a great race in defeat." Fry would not be drawn on where the gelding would go next, adding: "We'll see how he comes out of this but the owners are keen on Punchestown." Jockey Noel Fehily said: "The ground just dried out a bit too much for him. He pecked badly at the back of the last as well." Alan King was delighted with the performance of Messire Des Obeaux, who stayed on well to finish third. The Barbury Castle handler said: "He never missed a beat. He jumped well and we are really pleased with him." Anthony Bromley, racing manager to Simon Munir and Isaac Souede, was similarly delighted with the performance of Messire Des Obeaux, remarking: "It was a very hot novice hurdle. We were so pleased to get third place. He stayed on well, Daryl had him in a good position and he has run a great race behind two very good horses. "The handicapper had the two in front rated higher but we are very proud of our horses and can't wait to go chasing next year. He has much more relaxed as he is maturing so he may be an RSA or JLT horse I would like to hope for next season. We are very proud of him." Daryl Jacob, rider of the third, said: "He ran a great race."